Winpoint's Joe Geier, advisor to Cal Ripken Jr. and dozens of other pros, tells the story of how he broke into advising MLB stars. 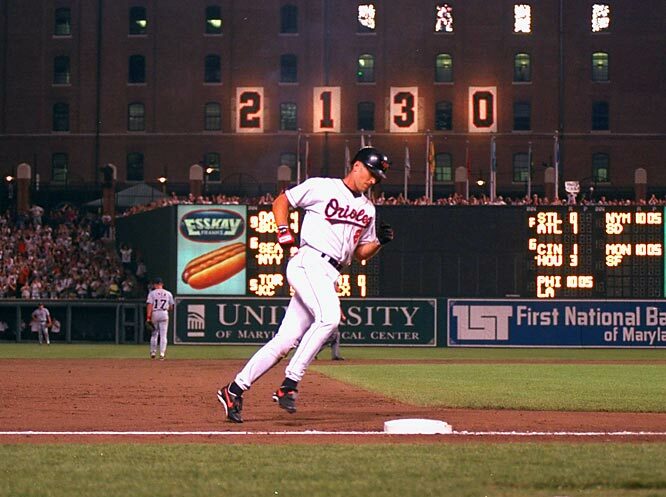 Baseball Hall-of-Famer Cal Ripken Jr. in 1995. Joe Geier manages the wealth of baseball stars like Cal Ripken Jr. and Mark Teixeira. He just added Cincinnati Reds pitcher Nick Howard to the client roster of the wealth management group he leads, Winpoint Financial, and its affiliated RIA, which has some $180 million of assets under management. In fact, the former-high school baseball player broke into this niche market by working at a savings and loan — and following up on a tip his sister gave him. The current success of the firms he heads in the Baltimore area, according to Geier, is tied to growing the business via referrals and maintaining a solid reputation. “I put myself through college by working at a savings and loan and wanted to help those with money manage their finances,” Geier said in an interview with ThinkAdvisor. By working for Shapiro, Robinson & Associates, Geier learned a lot about the sports-agency side of the business (including contracts), as well as the financial side. “I learned how [baseball players] make money and get paid, along with all the intricacies — this gave me a big leg up in the field,” he explained. He left Shapiro in 1990 to start his own CPA firm. “It just happened that there was a bunch of young players with the Baltimore Orioles, who were not their clients” and were in need of financial services. Over the next 10 years, he added some 30 clients, like Armando Benitez, Steve Finley and Reggie Sanders. In 2001, Ripkin needed some advice on his business ventures — including a minor league team, along with baseball camps and clinics for kids. “That was outside the scope of Shapiro, Robinson & Associates, so Cal asked me to help,” the CPA explained. Two years later, Shapiro wanted to trim down the practice to focus more exclusively on the sports work. “I purchased the financial side of the practice, and Brian Woods came over from Shapiro as a partner,” he said. The advisor has been adding more baseball players as clients ever since. Geier says he and Teixeira went to the same high school. “I reached out to his family before the [Major League Baseball] draft, and they hired me as a financial advisor,” he said. Winpoint picked up Howard as a client thanks to a recommendation, Geier says. But the group also closely watches names on the MLB draft. “I have a director of business development, Nicholas Durastanti, who does a great job reaching out to those being drafted and getting our name out there,” he adds. Durastanti follows baseball players via the rating agencies and works with the appropriate contacts. For instance, he “connected with Howard’s dad at the Arizona Fall League and requested a meeting,” Geier said. “We have a good relationship with the sports agencies and are what is called ‘agent agnostic,’ ” he added. Working with baseball players is tough, the CPA says, since their careers are very short. “Managing their money is difficult. You have to know what they are spending. It’s not a long-term business for everyone, because these guys have short careers, … often retire by 35 and then draw down their earnings,” Geier said.